It's no secret that in recent years the most ambitious and unique sounding electronic music has emerged from Australia. I'm happy to introduce DR listeners to the wonderful soundscapes of Point Guard whose most recent feat is the track 'The Xhase" on Pure Space's PS001.1 debut ep. His wonderfully deep and eclectic mix for DR features a lot of contemporary Australian sounds. Jacob was kind enough to take the time to answer a few questions, so let's dive in! Hi Jacob, can you introduce yourself and tell us what have you been up to lately? - Hey I'm Jacob, I produce music under the alias Point Guard. Lately I've been going to the beach, hanging with my girlfriend and writing music. One big event for you in the recent weeks must've been the release of PS001.1, the debut release of Andy Garvey's Pure Space label which features a track by you. Can you tell us a little about that? - I've known Andy for a really long time and I've had the privilege of watching her develop into an incredible DJ, radio host, producer and now label owner. Andy was the first to support my music, and for her to ask me to be apart of the first Pure Space release was a really big honour for me. The release features tracks from Daze, Reptant, E Davd and myself. The entire team behind Pure Space have done an amazing job, with some great projects in the works. Big ups Andy, Sophie, and Mija. Are the any other releases in the pipeline in 2019? - There are a few things in the pipeline, I can't announce it yet but there will definitely be more music before years end. 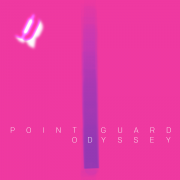 Tracking back a little, I'd really like to know about how Point Guard came to be. Can you recall a place in time where you realised that, yes, I want to make my own music and yes, I want to start dj'ing? - I started dj'ing long before I ever started producing music, producing was more of an afterthought in the beginning. I wanted to make music that I could play out, but I wasn't good enough in the beginning. I would get really excited about making music and think that everything I made was amazing, luckily I had people around me to give harsh, but constructive criticism. The Point Guard project came to be after I moved from Canberra to Sydney to pursue something more creatively. In Canberra I was writing music occasionally, but I was finding it extremely hard to juggle a full time job and find my identity as a producer. I moved to Sydney to study music, be around artists who pushed me, and find myself as a producer. - 16 was probably around the time that the least important musical memories happened for me. Once I turned 17 I was going to house parties and sneaking into clubs and that's when my fascination of electronic music really became something. When I was 10 I remember seeing the film clip for 'Freestyler' by Bomfunk MC's on the TV, I thought that video clip was the coolest thing in the world. I asked my mum if I could take DJ lessons when I was 10. She said no. Continuing on the same theme, can you list a few tracks, eps, albums, concerts or whatnot that really had a big impact on you? - Seeing Mr. Fingers live in 2016 will forever be the defining moment in my life where music made the most impact on me. Whenever I'm lacking inspiration I think back to that show and remind myself why I write music. Where do you draw your influences from when you produce music? - Everyday life experiences influences me as a producer. Weather, mood, food, emotions, it all plays a role in my approach to writing music. My friends play a big part too. Whenever my friends send me music they are working on I get really excited, it encourages me to be more productive. It's also cool to hear what people around you are working on and where their view on music is at. I've been waiting to ask this, what's going on in Australia?! In the recent years there's been a steady and constant stream fantastic forward thinking electronic music from down under. Very unique sound with a strong positive vibe. I hear hints of the same euphoria and openness of the early 90's (this is me being nostalgic! ...and old). What's your take on this since you have first hand experience? - The level of music coming out of Australia is of such a high calibre at the moment, it's great. Most of the music I play and listen to is by Australian artists, which is really refreshing. I think people are more accepting and open to listening to something different on the dance floor. People are encouraged to be themselves and express their emotions openly through music, and that's great. I feel that producers aren't afraid to take risks with their music. The rise of warehouse parties has certainly played a large role in shaping the sound too. People are moving away conventional spaces, and experiencing electronic music that may not necessarily involve a nightclub. These spaces can also allow artists to take more risks as dj's or live performers, and the crowd are welcoming the risks with open arms. Please drop a few upcoming Australian names that you think deserve more attention? - Escape Artist, Hymns, Roza Terenzi, Andy Garvey, PMA, Lou Karsh/Reptant, Freda & Jackson, Setwun. There are so many more artists to list off, but those names right there are at the top of the list for me. Are you playing out actively, any regular nights? - Not at the moment. PMA and myself throw the occasional party under the title 'Flying Blind'. We put that on hiatus for a while, but we are looking at getting back into it. As a dj and a producer, how does it feel to play out you own creations and get a good reaction from the crowd? - I trip out about it all the time. I like music that makes me want to dance and if my music is making other people dance then I feel like I'm doing my job as a producer. There is no better feeling than getting a positive response from people enjoying your music, or any other art form. Can you tell us a little about the collaboration between you and PMA under the Altsob 45 alias? - Altson 45 spawned from myself and Chris (PMA) hanging out all the time and writing music together. A lot of artists out of Detroit like Omar S and Moodymann have played a rather large effect on us as producers and I guess the project was a way for us to write music that we are inspired by. It's also a way for us to write music that may not necessarily be fit our 'sound' as individual producers. He's my dude. Hey radar. Wrapping up, what can you tell us about the mix you've put together for us? - This mix was recorded in my studio in Sydney. It includes a bunch of artists I enjoy listening too, starts off slow and gets heavier towards the end. I'm a firm believer that a mix should tell a story from beginning to end, and this mix follows that belief. And for the finale, can you share a picture from last few days?